The escalation in Nagorno-Karabakh, sometimes called “the four-day war,” which took place in April 2016, did not come out of the blue. There have been a number of major incidents on the line of contact in Nagorno-Karabakh, as well as on the Armenian-Azerbaijani border, ever since the 1994 ceasefire two decades ago. A dramatic increase in the number and intensity of the incidents was observed long before the April events: since 2014, tension started to increase, both in terms of quantity of incidents and the nature of the weapons used. While the majority of analysts seemed to think that a major escalation in Nagorno-Karabakh was unlikely, there were also voices in the policy community that pointed to worrying dynamics in the Nagorno-Karabakh region, warning that a flare-up could become the next big crisis in Eurasia. Thus, even though the recent round of fighting may have caught both the societies of the region and the international community off guard, it was hardly unpredictable. By spring 2016, a combination of internal and external factors made the military escalation more likely than ever. First of all, the tense international and regional climate made an escalation in Nagorno-Karabakh probable. Both Russia and the West were distracted by the crises in Syria and Ukraine. The refugee crisis, terrorism threat, and rise of populism dominated the agenda in Europe, while the US was in the midst of a ruthless election campaign. An important factor that might have played a catalyzing role was the Russian-Turkish confrontation after Turkey shot down a Russian military airplane in November 2015. Apart from increasing the overall level of tension in the region, it created a situation in which Moscow would be less likely “to punish” Baku for any activity in Nagorno-Karabakh, as doing so would risk “losing” Azerbaijan to its more traditional ally Turkey. This would have been unacceptable since maintaining “strategic partnership” with President Ilham Aliyev’s government is one of the priorities of Moscow’s policy in the Caucasus. In fact, Moscow has gone through great paints to make sure that this “strategic partnership” does not interfere with its “strategic alliance” with Armenia. While both sides are suffering from the current situation of the unsolved conflict, it is Azerbaijan that views the prolongation of the status quo as unacceptable and has been pushing to change it. Today, the Nagorno-Karabakh Republic is an unrecognized state, which controls not only the territory of the Nagorno-Karabakh Autonomous Region, as it existed in the Soviet times prior to the beginning of the conflict, but also adjacent territories, which Baku considers “occupied,” while Armenia and Nagorno-Karabakh consider them part of a “security zone.” Most suggestions for peace have revolved around the idea of exchanging “lands for status recognition” or “lands for peace,” or “land for security.” The so-called Madrid Principles, which are the basis of the peace proposals that had been put forward by the mediators, are suggesting a temporary solution, in which parts of the Armenian-controlled territory would be exchanged for an internationally recognized interim status for Nagorno-Karabakh, along with security guarantees and a mechanism for determining the status of the region in the future. However, so far the sides have been reluctant to make the concessions necessary in order to modify the status quo by achieving a breakthrough in the conflict resolution on the basis of these proposals. Hostilities broke out in the early hours of 2 April 2016. Azerbaijani forces advanced in two directions: in the north and south of Nagorno-Karabakh. In particular, they captured the village of Talish (where atrocities against remaining civilians were reported) in the north and the strategically important hill Lala-Tepe in the south. Karabakhi Armenian forces counter-attacked on April 3 and by the end of the day had retaken some of the lost positions. By the time the fighting ended on April 5, Talish was again under Armenian control, but Lala-Tepe and some other positions remained under Azerbaijani control. The sides differed in their assessment of how much land had exchanged hands and the importance of these positions. Later, Armenian President Serzh Sargsyan dismissed the importance of the lost positions, saying that it was “merely 800 hectares of land,” which had no strategic significance. The Azerbaijani side, on the contrary, celebrated the capture of these positions as a major achievement. Azerbaijan’s military campaign led to a consolidation of various groups of its population around a patriotic discourse. While, as per usual, both sides blamed each other for the outbreak of the four-day war, the logic of the status quo preservation strategy suggests that Yerevan and Stepanakert had few reasons to restart escalations. In the aftermath of the April hostilities, there were opinions in the media suggesting that the aim of Azerbaijan’s actions was to perform a blitzkrieg, while others argued that the fighting represented a more limited operation. Arguably, apart from testing the defenses on the line of contact, the operation pursued external and internal political goals: modifying the status quo in the peace process and testing the international community’s reaction to military action in the region, as well as consolidating Azerbaijani society around its ruling government. The latter goal was important in light of the internal socio-economic and political situation in Azerbaijan, as the country suffered from the consequences of a global slump in oil prices. Azerbaijan’s military campaign led to a consolidation of various groups of its population – including even a large part of the opposition and NGO sector – around a patriotic discourse, simultaneously marginalizing the government’s opponents. Another important goal was testing the reaction of the international community and the important players thereof. The reaction to the four-day war showed that the international community was concerned with the events in Nagorno-Karabakh. Most international players expressed concern and refrained from supporting or placing blame on either side of the conflict. The only exception was Turkey, which, not unexpectedly, expressed its support to Azerbaijan. International organizations such as the UN, EU, the Council of Europe expressed concern for the course of events and condemned the violence (without naming the side responsible), including the governments of the Minsk Group countries, as well as other countries of the region. However, the majority of international players were seemingly willing to delegate a leading role in dealing with the crisis to Russia, in spite of the contradictions that existed between the West and Russia with regard to many other global and regional issues. The majority of international players were seemingly willing to delegate a leading role in dealing with the crisis to Russia. As a result, it was Russia’s position that mattered the most. Observers have offered various interpretations of the Russian reaction to the escalation. In the view of Alexey Malashenko, “Moscow missed the beginning of the conflict…in the beginning it simply did not know what to do.” However, the general line of Moscow was to keep the balance. Russian Prime Minister Dmitry Medvedev visited both Yerevan and Baku in the immediate aftermath of the four-day war, and made statements that were extremely cautious. There were some exceptions though. The Collective Security Treaty Organization (CSTO) Secretary Nikolay Bordyuzha released a statement on the first day of the conflict that placed the blame for escalation on Azerbaijan. On the other hand, several days after the four-day war, Russia’s Deputy Prime Minister in charge of the defense industry, Dmitry Rogozin, visited Baku and not only announced that the arms sales to Azerbaijan would continue, but dismissed his Armenian critics calling their criticism “demagoguery.” A Russian expert ascribes the discrepancy in such statements to a lack of coordination among various Russian state agencies and officials. In any case, it was Russian mediation that put an end to the fighting, when Yuri Khachaturov and Necmeddin Sadyghov, Chief of Staff of Armenia and Azerbaijan respectively, agreed to a ceasefire at a meeting in Moscow. While skirmishes and shootouts continued in the following days, in general, the ceasefire was respected. A Window of Opportunity or a Threat of Further Escalation? However, since then, no major breakthroughs in the peace process have been observed. Even the limited suggestions regarding mechanisms of observation and investigation of incidents, which were discussed in Vienna and St. Petersburg, failed to materialize. There was much speculation in the aftermath of these meetings as to whether there had been attempts by Russia to push the West out of the peace process, or vice versa. However, one should remember that throughout the mediation efforts, various actors were taking upon themselves to initiate a resolution, with support (or at least declared support) from the other co-chair countries. Russia’s policy of maintaining the balance between Armenia and Azerbaijan led to serious tension between Moscow and Yerevan. The situation in the conflict zone remains tense: the explosive situation in the wake of the April incidents could not be neutralized by one or several meetings, even at the highest level. The four-day war radicalized the societies and the political elites on both sides of the conflict. In the case of Azerbaijan, the April events have arguably led to a situation in which Baku is unlikely to accept the need for compromise – at least a compromise that would be more or less acceptable for Yerevan and Stepanakert. Although territorial gains made during the April incidents were rather insignificant, they brought Baku some dividends, particularly in domestic politics. The four-day war enabled authorities to keep internal instability – caused by the fall of energy prices and socio-economic problems – at bay. The pro-government media are playing up the alleged successes in the four-day war, raising more expectations in society. In such an atmosphere, Baku is unlikely to make any serious concessions that any compromise would entail, as that could endanger the “victorious” narrative, which had been created around the April events. As for the Armenian side, there seems to be an illusion among some observers that in the post-April context, its government could be pressured into making certain concessions to prevent another eruption of hostilities. This perception, however, is quite far from reality. In fact, the opposite is true. In the post-four-day war context, calls are voiced in Armenia and Nagorno-Karabakh “not to give away an inch of land to the enemy.” These calls often go hand-in-hand with criticism of the authorities for their lack of preparation for the sudden Azerbaijani attack in April, for not doing enough to eradicate corruption in the armed forces, and for not taking a tough stand in the negotiating process. Whether these allegations are fair or not, this mood in the society means that if the Armenian authorities were to make any concessions under these circumstances, it would amount to a sign of weakness, which is fraught with unpredictable consequences for the country’s political elite. As for Stepanakert’s leadership, for years it has argued that it could not trust the negotiation process, in which it was not directly involved, and the April incidents only deepened that mistrust. The four-day war radicalized the societies and the political elites on both sides of the conflict. Against this background, it is hard to imagine that in the current context there could be a breakthrough in the settlement of the conflict. Nor is it likely that the mediators will manage to bring about the signing of any significant agreements, even if they do not go beyond the reiteration of the fairly vague Madrid Principles, which have, in various modifications, provided the basis of the talks over ten years. Moreover, even the implementation of the measures aimed at strengthening the ceasefire is open to some doubt: the distance between declaring the agreement of the parties and actual implementation of these mechanisms may turn out to be considerable. Even if these measures are adopted, as the experience of settling other conflicts shows, the presence of observers and investigation mechanisms does not guarantee that the ceasefire will be honored. On the other hand, another large-scale confrontation has so far been avoided. Even though there have been numerous incidents, so far none of them have reached the level of the April escalation. It is unlikely that these incidents will stop, but it is also unlikely that they will lead to full-scale war. Thus, a peculiar situation in the Nagorno-Karabakh conflict has emerged, which can be described as a “dynamic status quo,” to use the phrase suggested by Russian analyst Sergey Markedonov. This is a situation in which the status quo can hardly be considered stable, as at least one of the sides is constantly attempting to change it. However, these attempts remain within certain limits. In other words, while hopes for a breakthrough in the conflict resolution process have been futile, so far the fears of a new large scale escalation have also failed to materialize. The article is partly based on a research project implemented by the author with the support of The Hurford Fellows Program, sponsored by the Carnegie Endowment for International Peace and made possible by a generous grant from the Hurford Foundation. The views presented in the article are those of the author. On the creeping escalation of violent clashes in 2014-2016 see Laurence Broers, “The Nagorno Karabakh Conflict Defaulting to War,” Research Paper, Russia and Eurasia Programme, Chatham House, July 2016, pp. 6-8. For an informed discussion on this question see Broers (2016), pp. 16-18. The Minsk Group is co-chaired by France, Russia, and the US. The Minsk Group also includes the following countries: Armenia, Azerbaijan, Belarus, Germany, Italy, Portugal, the Netherlands, Sweden, Finland, and Turkey. Expert interview, Moscow, July 2016, Vadim Mukhanov. 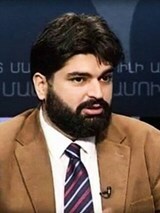 Dr. Mikayel Zolyan is an analyst at the Regional Studies Center in Yerevan, Armenia.